A must visit: Anyone heading to the North Island of NZ needs to see Hobbiton. New Zealand’s North Island can sometimes be overlooked for travellers who want to explore the south. But the North Island is an incredible place to see with your own eyes. Imagine picturesque mountain ranges, lakes, glaciers and coastline. The North Island also has warmer weather, which is perfect for summer campervan adventurers. If you’re stuck for transportation, consider hiring a cheap campervan from Auckland to explore these incredible destinations. This is easily one of the most stunning coastal areas in New Zealand, and you surely can’t miss it. There are more than 140 gorgeous islands to visit. You can jump on board a sailing boat for the day, go fishing or relax by the beach and beautiful harbours. If you have extra time, visit the remote Cape Reinga. Lord of the Rings made New Zealand and its incredible mountain scenery famous. 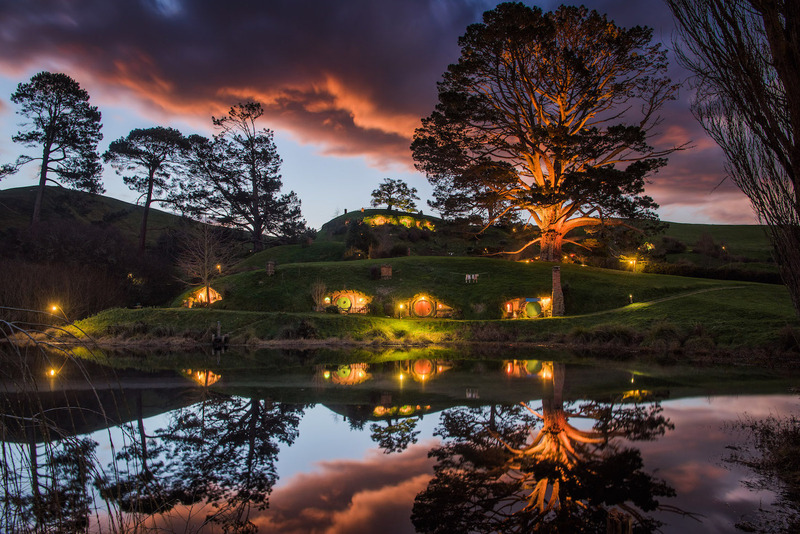 Fans can see Middle Earth come to life by visiting the lush Waikato countryside where the triology was filmed. Sign up for the Hobbiton Movie Set Tour, which takes you to Hobbit holes, Party Tree and the Green Dragon Inn, to name a few sites. New Zealand’s capital city sits at the bottom of the North Island. Rolling hills and a beautiful rocky coastline surround Wellington. The city is popular among locals and travellers for its reputable culture, dining, nightlife and it’s also easy to get around to visit different sites. Witness incredible geothermal activity like colourful mineral pools and bubbling mud across this volcanic landscape. This stunning country area is also a great place for cyclists and thrill seekers, like people who want to try out bungy-jumping. Taupo, New Zealand’s largest lake, is a scenic beauty, with a mountain backdrop. If you think the mainland of NZ’s North Island beautiful then another world awaits below Waitomo. There’s an intricate maze of limestone caves complete with stalactites and glowworms. These amazing creatures light Waitomo Cave’s walls like a galaxy of stars. Other popular activities in the area include hiking and rafting.